The AICPA ethics exam is required by most state boards after passing the CPA exam in order to become certified and obtain a CPA license. The CPA ethics exam is a take-home test that comes with a textbook and is taken online. 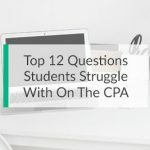 I’m sure that last thing you want to hear after you pass the CPA exam is that you have to take another test, but this one is pretty easy and can be taken as many times as you need to. Let’s talk about the ethics exam details, how to sign up for it, and how to pass it. 3 What is the CPA Ethics Exam and Who Administers it? 6.1 Do All States Require the CPA Ethics Exam? 6.2 How Difficult is the CPA Ethics Exam? 6.3 Can I take the Ethics Exam Before Passing the CPA Examination? 6.4 Is There a CPA Ethics Exam Study Guide? 6.5 How Long Do I have to Take the Ethics Exam? 6.6 I Failed the CPA Ethics Exam. Can I retake it? The ethics exam consists of 40 multiple-choice questions that can either be taken online or on paper. If you choose to take the exam online, it will be graded immediately and you will have your score as soon as you submit it. If you choose to take the exam on paper, you will be mailed an answer sheet to fill out. Once you fill out the answers, you will have to mail in the sheet to the AICPA grading center for scoring. It will probably take a few weeks for them to grade it an notify you of the results. What is the CPA Ethics Exam and Who Administers it? The CPA ethics examination is written and administered by the AICPA in an effort to prepare CPA candidates for the ethical problems they may experience in their public accounting careers. It’s an online or take-home test that can be taken anywhere. You can take it at home or at work. It’s timed, but you are allowed to use your textbook to answer questions if you have enough time to look up the answers. The states that require candidates to take the ethics exam typically require that candidates pass it within 2 years of passing the CPA exam. Some states allow candidates to count this exam towards their CPE credits for that year. Not all states allow this treatment, however. There are a few steps to successfully take the CPA ethics exam. Don’t worry. It’s not hard. Obviously, the first step to taking the exam is to sign up for it. You can sign up for it and purchase the review materials on the AICPA website. Each states’ exam costs vary, but they typically range from $150 – $190. Once you sign up for the exam, you will be mailed a self-study textbook or CD-Rom with study materials on it. The self-study course should be called Professional Ethics: The AICPA’s Comprehensive Course. Make sure you get the one for “licensure” and not one strictly for CPE. This is kind of obvious, but it needs to be said. Use the study materials. Lol. So many people blow this exam off and treat it like a joke. It’s an easy test, but it’s not that easy. Read the study materials, so you can make sure to pass the exam on your first try. There’s no reason to have to pay to retake this multiple times. Simply read the book, take some notes, and be prepared to take the exam. Remember, you have to get a score of 90 to pass the test. You can’t afford to miss too many questions. Read them carefully and give yourself enough time to properly take the exam. There are two ways to submit your answers depending on how you took the exam. If you took the exam online, all you have to do is hit submit when you are finished taking the exam. Your test will be graded automatically and you will be notified immediately with your score. Some people prefer to take tests on paper. If this is you, you will have to mail in your exam answer sheet and wait for the results. Your answer sheet will have the AICPA mailing address on it. Simply mail it in and wait a few weeks for your results. Ethics Exam Tip: Make a copy of your answer sheet before you mail it in. Who knows what’s going to happen in the mail. On the same lines, you should mail your answers in using certified mail. That way you will know that the AICPA received it. Do All States Require the CPA Ethics Exam? No, not all state boards require their candidates to pass the ethics exam, but most do. Just over 35 states require candidates to go through this form of ethics training before they can become licensed. This seems to be a trend among state boards, so I wouldn’t be surprised if the remaining jurisdictions require ethics requirements in the near future. How Difficult is the CPA Ethics Exam? It’s super easy. Don’t worry about it. All you have to do is read the 100-page textbook that is sent to you after your registration and you will be able to pass the exam pretty easily. Although the exam requires a score of 90 to pass, it’s all multiple-choice questions and most are pretty simple. Can I take the Ethics Exam Before Passing the CPA Examination? Yes, you can choose to take the ethics exam before you pass the CPA exam. There’s nothing wrong with doing this, but it’s kind of pointless. Don’t worry about getting this out of the way. Is There a CPA Ethics Exam Study Guide? The only study guide that exists for the ethics exam is the one issued by the AICPA. Don’t worry. You shouldn’t need anything more than that. How Long Do I have to Take the Ethics Exam? Most states require that you pass the ethics exam within 2 years of passing the CPA exam. Also, the AICPA allows 1 year from purchasing the ethics materials to take the exam. I Failed the CPA Ethics Exam. Can I retake it? Yes, you can retake the exam online up to three times. If you fail it three times online, you will have to use the paper/mail method to retake it a fourth time. If you are just starting your CPA journey and simply doing research about the ethics exam, you will need to pass the CPA exam first. The best way to ensure that you pass on your first try is getting a CPA review course that works for you and your learning style. I reviewed all of the top courses, so you can find one that fits your study schedule and budget. Take a look at my list.